What Would Organ Pipe Ranger Kris Eggle Think Now? ©Bert Gildart: When you park your vehicle at the Kris Eggle Visitor Center in Organ Pipe Cactus National Monument, the first thing you see is a gravestone (a boulder) adorned with a plaque. 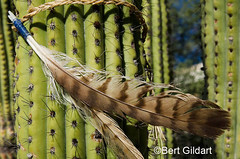 Just above it two hawk feathers have been affixed to the stem of an organ pipe cactus, and when the wind blows, the feathers flutter gently suggesting a moment of great peace. The marker, the plaque and the feathers are all back dropped by bold letters near the roof of a substantial building and they read Kris Eggle Visitor Center. The combination of features reminds visitors that not too long ago a man was killed by a drug runner in this National Park Service administered national monument. 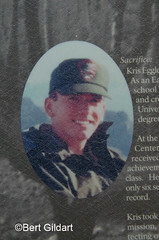 On that fate full day Kris Eggle was on the trail of a man who had illegally crossed the U.S./Mexican border less than five miles to the south with the intent of selling drugs. A radio message from an overhead helicopter had alerted Kris that the man was hiding behind a huge Saguaro, and when Chris turned the man shot and fatally wounded him. 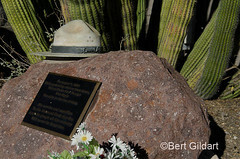 L to R: Hawk feathers drape from organ pipe branch and often flutter in desert winds; image of Kris Eggle near grave marker; hat, plaque and flowers back dropped by organ pipes. Was slain in the line of duty. Tragically, the conditions that resulted in Eggle’s death still exist. Thousands of illegal immigrants still cross the borders bringing drugs, and I know this is true as I overheard a conversation the other day in which a park volunteer described an incident that occurred at Victoria Mine just a few miles from the Twin Peaks Campground. Five days ago, Janie and I had hiked to that area so the narration was of particular interest. The volunteer had been looking down from a ridge when he saw four Mexicans. Shortly thereafter they picked up huge packs, which later (after being apprehended by park rangers) proved to be filled with drugs. With a street market for these drugs in the thousands, these men were dangerous. Looking towards Mexico from Bull Pasture, an area that remains open. Sadly the incident is not isolated, and certainly I don’t know the solution. Nor do I know what Kris Eggle would think. The only thought I have is to create a penalty that would be so severe for such transgressions that illegal immigrants of all kind will give more serious thought to stealing across the border here in Organ Pipe. 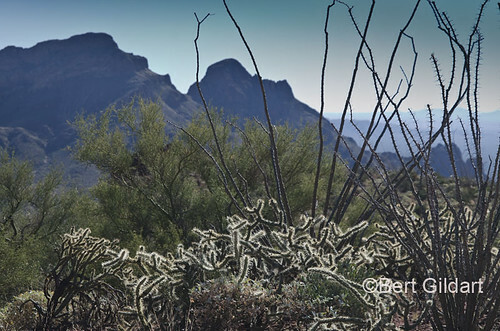 This park contains natural history features found nowhere else in North America and they are so unique that Organ Pipe has been designed by UNESCO as a World Heritage Park. Right now over 60 percent of the park is closed to Americans, and that is a travesty. This entry was posted on Wednesday, December 5th, 2012 at 9:27 am and is filed under Natural History/Conservation, Outdoors, Photography, RV Travel, Travel, View Point. You can follow any responses to this entry through the RSS 2.0 feed. You can leave a response, or trackback from your own site.